Empties & speedy reviews #12 featuring Alpha H, Garnier, Xen Tan, Ren, origins & more! I really seem to be flying through products at the moment, but then again if you've seen my hauls, you'll know that I've been re-stocking quite quickly too! Today I have a mixture of skin care, body care with a few randoms thrown in! Some you will have seen on the blog before, but I'll do speedy reviews and tell you if I would buy them again! I'll start with skin care: I finished a bottle of Garnier Micellar Water, which I prefer to Bioderma. It is inexpensive but effective. It removes my make-up so quickly & easily before I move onto my cleanse with a balm. I will repurchase. Next up is Alpha H Liquid Gold. Liquid Gold is the perfect name for this product! I have already repurchased and will review soon. Origins Super Spot Remover is another amazing product. It literally blitzes spots! If you feel a spot coming on, apply some of this and within 2 days, it will be gone! I will definitely repurchase it. Ren Glycolactic Radiance Renewal Mask is another product that I have already repurchased - I am now on to probably my 6th bottle of this mask. This is a brilliant mask for giving instant results - skin looks brighter and more refined after using it. Aveda Botanical Kinetics Exfoliant is a product that I probably won't repurchase for the moment because I loved it initially, but as time went on, I didn't find it to be as effective as other chemical exfoliants I have used. I finished a small bottle of Ghost Eclipse perfume and I have already repurchased it. I really like this fresh, sensual scent! My Real Techniques Buffing Brush and Miracle Complexion Sponge are both beyond use at this stage! I really love the Buffing Brush and will probably repurchase at some point and I won't repurchase the sponge because I prefer the Beautyblender. On to body care: I finished a bottle of Xen Tan Dark Lotion Absolute Luxe. I love Xen Tan products, but prefer their Moroccan Tan to this one and actually find it to be darker than this tan, which is advertised as their darkest tan. There is also a can of Cocoa Brown Dark 1hr Tan Mousse in here, but it isn't actually empty! I can't get any more out! Disappointing! I have bought a lot of fake tans recently, as you probably saw in my recent haul, so I won't be repurchasing either of these for a while. I love Bio Oil and recently finished a 200ml bottle. It is a brilliant multi-purpose product that I always like to have in my stash and will repurchase at some point, but not at the moment because I have recently bought some L'Occitane body oils. Clarins Hand and Nail Treatment Cream is one of my favourite hand creams & I was gutted to finish it and will definitely repurchase at some point. I got a small tube of Dr PawPaw Multi-purpose Balm in a Look Fantastic Beauty Box a few months ago and I LOVE it! I reached for it more often than my Bite Beauty Agave Lip Mask because it is easier to get out of the tube! It is brilliant, not just for the lips, but for other areas of dry skin, I will definitely repurchase. Finally (! ), I finished a tub of Soap & Glory Orangeasm Body Butter, which I LOVE and will definitely repurchase along with other products in the range. I love the scent and also love how moisturising this product is! 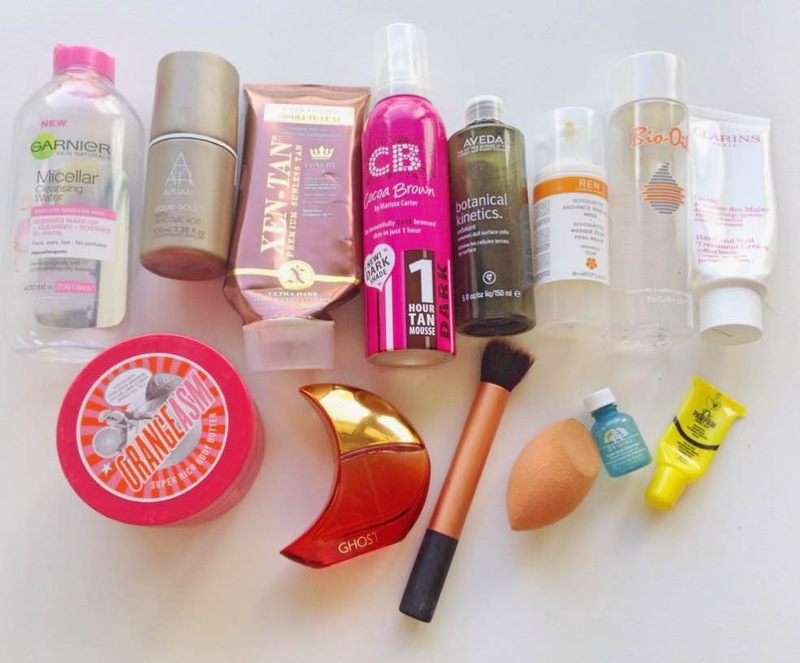 So that's it for this empties and speedy reviews post! I seem to go through skin care and body products much more quickly than make-up - are all of you the same? Please tell me I'm not the only one! !